iTag is a kind of Bluetooth 4.0 low energy consumption product which works through iTracing APP. iTag can connect user's easy-lost & valuable belongings together and works with smart phone to prevent lost. 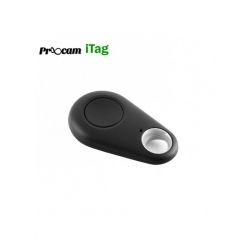 iTag is also a remote control of your smart phone camera for selfie. In addition, iTag can provide a last seen pin-drop on map to help you recover your items and search your cars in parking site. 1. Please download iTracing APP in the app store or Google play before using it. 2. Automatic alarm when it is beyond the effective range. 3. Take a selfie, it can capture the happiest moment easily. 4. Bluetooth version 4.0, ultra-thin design, easy to carry. 5. Rings plus vibration reminder alarms, multiple ringtones available. 6. Compatible with IPHONE 4S / 5 / 5S / 5C, IPAD MINI, IPOD TOUCH 5, IPAD 3 / 4, IPAD AIR and other cell phones support Bluetooth v4.0 and with Android 4.3 or above system. 7. Replaceable coin cell battery. 8. Low-power Bluetooth technology, battery's life is up to one year. 9. Positioning function allows you to see on the phone where your objects locate. 10. One cell phone can manage simultaneously up to eight anti-lost device.